Ji Enxu (Zhou Tianhe) curates over the exhibit and explains the differences between the designs over the years and scholars’ re-imaginations. 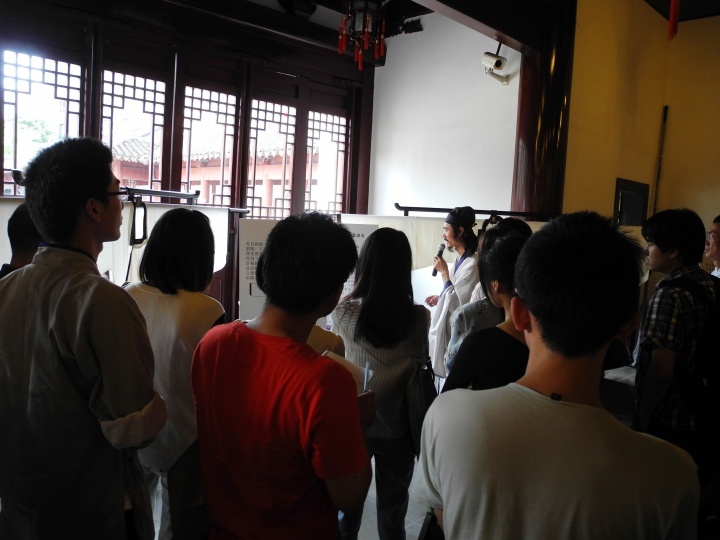 On September 29, 2012, fashion design group Celestial Spring and several renowned Confucian scholars ran a 2-day exhibit on the evolution of the Confucian scholar standard regalia – the Shenyi. Often deemed as “the most original and antiquated Chinese robe design thought possible,” the loose robe’s design is long thought to be a static, rigid standard due to its unchanging definition that fills the entire contents of the Book of Rites’ chapter XXXIX. The group referenced various Confucian scholars’ detailed annotations on the Shenyi standard over the span of 1,700 years, and has produced replicas of 12 robes to come to an astounding conclusion that not only our perceptions of the past often clouded by mysticism of the textual ambivilency, but the same can be said that of our ancestors, in no less a degree than our wild imaginations and re-imaginations today. Below are the 12 Shenyi robes, as well as the textual account given in the exhibit. Note that most names of historical figures are addressed in last name-courtesy name basis, with their first names addressed on a separate line in Confucian tradition in respect of prominent figures. It is particularly important to see, through this display of actualized reproductions of shenyi designs and its concepts throughout the ages, how imaginations of what “Chinese clothing”, “Confucian sartorial regulations”, and how text is interpreted by different diciplines and individuals. In another perspective, it also represents how the changes in Chinese fashion, or the absence of visible environment for the clothing (such as the Qing) has affected the imagination of Han Chinese clothing. 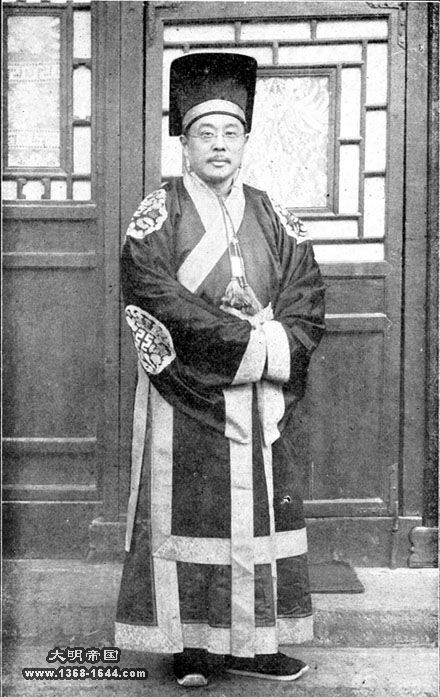 A Republican official in ritual dress. 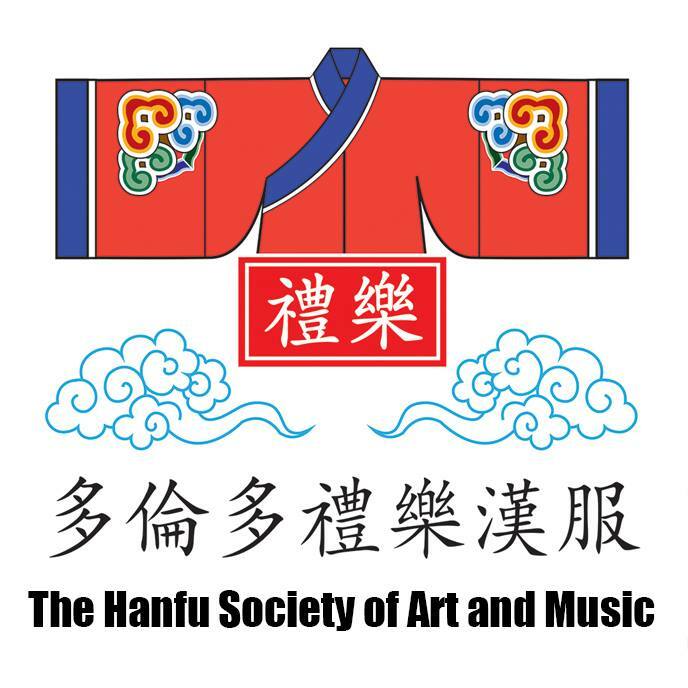 Translator’s Foreword: In regards to Hanfu in the Republican era (1911-1949), two major essays are readily available in Chinese, one in academia and one outside. 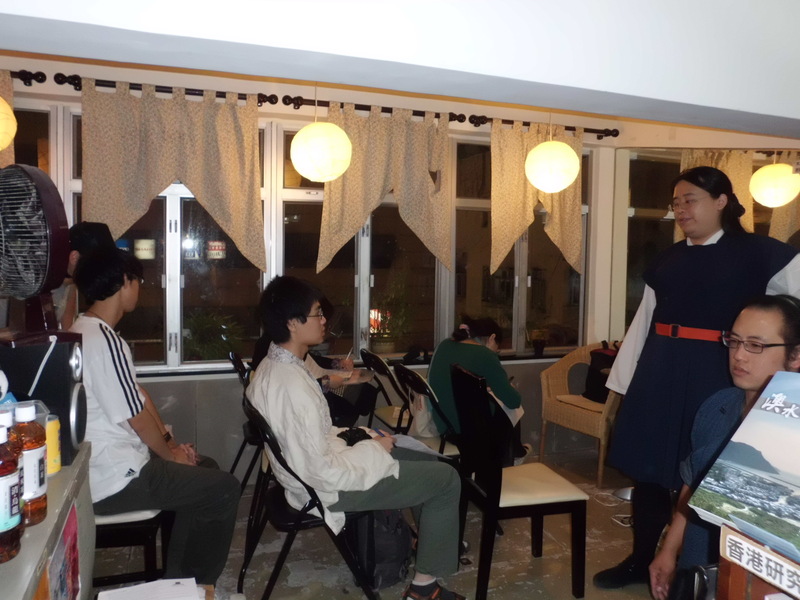 The other one is a photo-essay posted on Baidu Hanfu bar located here, which sources occurances of Hanfu from biographical and photographic evidence from the period. Translated from Chinese journal article by GAO Xialing and CHENG Xiao-Ming, “Shi lun Qingmo Minchu Hanzhuang Fuxing de Jiyu [Brief Comments on the opportunity of Han’s dress in Chinese modern times]”, from Journal of Xinzhou Teachers University, Vol.21:3, Xinzhou: 2005. Original Chinese versions can be obtained from Wanfang Data at http://d.wanfangdata.com.cn/periodical_xzsfxyxb200503018.aspx or http://d.g.wanfangdata.com.hk/Periodical_xzsfxyxb200503018.aspx, reposted in http://tieba.baidu.com/f?kz=52423925. Translated Abstract: “Restoring Huaxia Clothing and Headress” encompasses restoration of the ruling position Huaxia ethnicity, as well as reviving their outer appearance and posterity in their dress. The fall of the Qing and rise of the Republic provided a historic opportunity, but due to the “Westernizing” penchant in the modernization process, the appearance of Han clothing was considered as “antiquarian” and overlooked, its political and cultural meanings are left to be discovered. Today, The reappearance of hanfu on the streets is a reprise and continuation of the phenomenon. Less people this time, but still a decent turnout. Thanks to all who came and participated in the discussion! For those who have missed our lectures, please feel free to download the audio recordings and listen in with the conjunction of the corresponding Powerpoint slideshow for an optimum experience. Hopefully, a Chinese and later English transcript of the lectures will be made available.